13 Comments This post may contain paid and/or affiliate links. Please see our disclosure policy for further information. I remember holding my screaming, colicky first-born child, craving sleep. I fantasized about what life would be like when she could cut her own meat, get herself bathed and dressed, and speak in complete sentences. That baby is now 15. She wolfs down a steak in record time (after photographing it for her Snapchat story), has traded the colic for sass, and spends hours creating the perfect eyebrow and contoured cheeks with makeup products that cost almost as much as the monthly mortgage payment. I, along with many other moms, spent the bulk of my kids’ (I also have twin 13-year-old boys; yes, please pray for me!) preschool and elementary years at home with them. I had occasional odd jobs, part-time jobs, and work-from-home jobs, but my primary focus was staying home with the children and managing the affairs of the home. And I thought that was the hard part. You know — colic and temper tantrums and locating lost pacifiers and fighting a new nap routine. For our family, the teen years are proving way more demanding. Parenting teens makes working a “normal job” really tough. Don’t get me wrong; the little kid years are difficult (heck — raising children is just hard work, period! ), but I think most people (and I once included myself in this group) believe when the kids become teens, they somehow require less of you and your time. They don’t need you for every little thing, and they can tell you what they do need with sensible language. You can dine out again. You can leave them home alone. You can resume that career you put on pause a few years ago. While many of my teens’ earlier needs have disappeared and dining out is, indeed, now a mostly enjoyable experience, parenting my children these days is just as consuming — if not more so — than when they were younger. Throw in the added pressure of caring for elderly parents, which is the reality for many of us in our 40s and 50s, and life becomes an absolute blur. And do I even mention the hormonal upheaval of undergoing peri-menopause and menopause? Working a “normal” job just seems way too hard, and the cons far outweigh the pros. There has to be a better way to make a living and take care of yourself and your family, right? A few years ago, I decided to return to a “regular” office job as a staff writer part-time while I also worked part-time in retail. For most anyone, this would be a great combination, and I thought it would be for me too. Since my oldest had just hit teenage-hood and my younger two were still tweens, I was under the impression that I could hit “coast” until the last one crossed the stage at high school graduation. It didn’t work that way at all. With the office job, I was expected to be in the office at a certain time until a certain time on certain days of the week. I also needed to travel across the country about once every few months to conduct on-site interviews. The retail job required working odd hours and weekends, which meant I missed ballgames and concerts occasionally. When I worked late, I’d inevitably be dragging the next day, with little to give to my family. And the holidays? Black Friday was exhausting, I had to miss church with my family on Christmas Eve, and working New Year’s Day meant turning in early on New Year’s Eve. I loved the work I did, but it was incredibly hard on my family (which, of course, made it hard on me). After almost two years at the retail job, I quit, and earlier this year, the office where I worked restructured, which moved me to a contract writer with monthly assignments. Faced with what to do next, I started looking for a full-time, office-based position. I made decent money, and it was predictable revenue, so another similar job was appealing. But both the increasing demands of my family and the draw of independent business ownership tugged at me. I’d always wanted to work full-time as a freelance writer, but I had been afraid I couldn’t make it. I worried: How much would people be willing to pay me for my work? How would I get clients? Am I actually good enough to launch out on my own? I decided to give it a good faith effort and dove in head first at building my client roster. By the end of the first month, I had almost replaced my previous income. By the end of the second month, I reached that first milestone of replacing my income. By the end of the third month, I made double my previous monthly income. I was honestly surprised that my work-from-home venture was working and working so well! All of my questions and insecurities vanished as the assignments rolled in and continued to multiply. Should you try a midlife career change to work-at-home? If this is your question, then I think the answer is “yes,” primarily because you’re asking it! 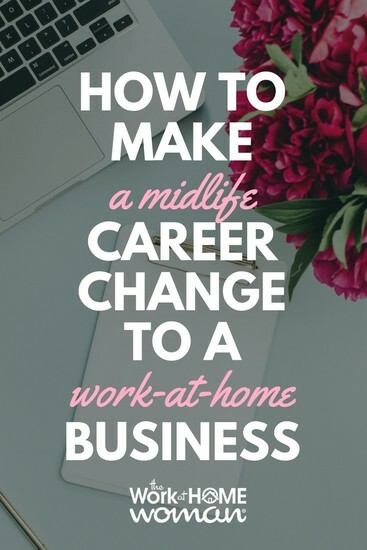 I also encourage you that making a midlife career change to working from home is not only possible; it also can be incredibly fruitful! You feel torn every day between expectations at work and the demands of your family. You hate negotiating time off for appointments, for personal matters, to stay home with sick kids, etc. You’d love to join a weekly exercise class, Bible study group, knitting club, or some other gathering but aren’t able to because you have a job. You’re missing out on key events with the family because of work commitments or travel, and you hate it. Your employer is not flexible and won’t allow you to work from home for even one day a week. You don’t mind working at “odd” times if it means you can dictate your schedule. And you are happy to trade off working a late night or two in exchange for attending events and activities with your family. You want to be your own boss, dictate your schedule, and make your own decisions about prioritizing your time. Just because this work-at-home idea may be new to you, don’t be afraid it won’t work for you. You have more in the plus column saying that it will than you think! By mid-career, many of us — regardless of industry — have at least 20 or so years of experience under our belts. Even if you’ve had one foot in the work world and one foot at home with kids (like I did), you still have experience and contacts that will serve you well. Think creatively to determine your transition. My daughter’s best friend’s mom, Candy, has been an attorney for more than 25 years. She’s been in and out of law firms and corporate law teams while raising three kids. We went to the beach this summer with our girls and on the way there talked about her unhappiness at her job and her exhaustion from caring for her sick, elderly mother, while parenting a teenage girl, a 21-year-old son with autism, and a twenty-something son who hasn’t quite yet flown the nest. After we talked, I convinced her to look into freelance writing and editing in the legal industry. I also told her to consider legal transcript proofreading. She had never seriously considered either of these things before. She had only ever thought of herself as a lawyer in a law office, but after our talk, she’s actively pursuing her work-at-home career. In fact, she’s already quit her office job and is taking a transcript-proofreading course. The beauty is – almost any industry can be taken home. Whether you’ve worked in medicine, technology, education, or sports (and everything in between), you can find a work-at-home niche that you can adapt to what you know, where your experience is, and what the industry needs. Besides your primary industry, what other skills or interests do you have? Writing, cooking, photography, etc.? How can you combine the two in a new work-at-home role? How can you serve your primary industry in a new way? What are the pain points in your industry, and how can you alleviate that pain? Websites such as The Work at Home Woman make research easier as you branch out regarding your expectations and weigh the possibilities. Tap into your vast experience to move forward. Do not underestimate all of the jobs and assignments — even volunteer work — you’ve done over the years, as you seek to build your work-at-home business. Neither should you dismiss all the friends, neighbors, relatives, co-workers, clients, and colleagues with whom you’ve made contact or done business. I know you hear it all the time, but it bears repeating: Growing and maintaining a successful business is about who you know. At least that holds true for me: Every single one of my current projects has originated from relationships with former co-workers or friendships established decades ago. Reaching out to former colleagues to let them know what you’re doing now. Ask them for referrals, to keep you in mind for future needs, etc. Stay active on LinkedIn. Check in with various friends in a casual, yet sincere, manner. Offer a heartfelt connection, expecting nothing in return; people can smell a phony sentiment a mile away. Once you’ve made the switch to working at home, make sure your LinkedIn profile reflects that. State that you’re open to working with new clients (or something similar) in your bio. Find beneficial online communities with whom to connect for support with marketing and referrals. Be careful here. “Online communities” can be a vast wasteland of time-sucking activities. Begin your research here at The Work at Home Woman and then branch out to follow reputable sources in your niche. Now is the time to begin your work-at-home business. It’s never too late to start a work-at-home business. If you want to do it, do it! Mid-career is the ideal time to begin because women at our career stage have tons of experience and contacts, which all contribute to success. The freedom and flexibility of working your own business from home is ideal for busy moms of teens and daughters of elderly parents. The potential for growing and scaling your business is virtually limitless. I am finally doing what I love, working at home on my own terms and dictating my own schedule. I have the freedom to spend my time in the way I want, and I rarely feel torn between work and family. The bonus? I’m on track to make almost 20% more this year than last year, and I’m working at least 10 hours less per week than when I had an office job. It’s an incredible experience that I hope you create for you and your family, too. 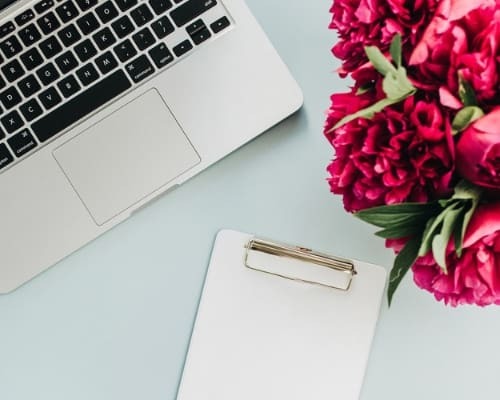 Mary Parker Bernard has helped all types of companies — from small brands to multi-million dollar franchise corporations — grow their businesses through blogging and content marketing. She is a freelance writer and editor based in Nashville, TN, where she resides with her husband and three teenagers. Find out more about Mary and her business, A Way With Words, at maryparkerbernard.com. Great advice! I would love to work at home. Thank you so much for Sharing! Glad you enjoyed Mary’s article, Janelle! Love this!! Awesome work, Mary! Proud of you for taking a risk and for working hard to make it happen! You are inspiring others! Would love to connect next time I’m in the Nashville area! I would love to have a Stay At Home Job. I have 26+ years working in vast business office’s. I also really enjoy Data Entry have that many years experience. Is there something out there for me?? I am a crafty craft making person. I seriously enjoy Planning Special Events. Your skills are totally transferrable. You could do all sorts of business office-type jobs from home: data entry, customer service, bookkeeping, virtual assisting, etc. As far as crafts go — so many possibilities there! Open an Etsy shop or start a Facebook page, post pics of your crafts and start selling. And planning special events — again, many ideas here! Weddings, receptions, parties, kids’ parties, school groups, corporate events/meals/conferences, etc. Thank you for sharing! I would love to be doing my own thing from home. I envision something combining freelancing as well as presenting and maybe even consulting/counseling in the field of pregnancy and infant loss. What are your thoughts about something like that? As long as you have the proper training, you should be able to do that from home. Programs like Skype and Zoom make it possible for clients and consultants to talk face-to-face without having to actually be in the same room. Good luck and keep us posted! I agree with Holly. Go for it! I’d also suggest starting with a written component to help promote your work. Even if you’re not a writer, per se, you could still launch a blog or website dedicated to the topic and simultaneously promote your consulting/counseling. A self-published book is also a terrific “calling card,” and a ghostwriter could help with that. So – yes, go for it. I see that your next step is just to promote that “side” of your business and start finding clients. Amen and Amen Mary. What we do is an amazing opportunity for which I know I am blessed to have. I couldn’t make what I make online anywhere here locally. Congrats!! YOU are an incredible example of a mama who’s crushing it as a freelancer/independent business woman! I’ve always looked up to you as an inspiration. :) Thanks for commenting, and congratulations on your success, too.